Winter weather makes everything a little bit trickier. Even small things, like picking up your garbage, can become complicated when there are several inches of snow on the ground. To ensure that you receive consistent service, please make sure to follow these guidelines. How should you prepare your trash for collection? Trash Cart: Use trash bags and keep the lid closed. Drivers will not reach into carts to remove items frozen to the bottom. Recycle Cart: Place items directly into the cart (NO PLASTIC BAGS). Keep lid closed. See your recycle chart for instructions. Where should you put your can when there's snow on the ground? Dig out a spot for your can where you usually place it (typically the end of your driveway). Place the cart on a level area with no more than 3 ft. from the street with wheels away from street and lid opening to the street. Do not put garbage cans on the street, as this creates a hazard to vehicles and street cleaners. Do not place your can on top of snow piles. Melting or shifting snow could cause the can to fall over and spill. It also makes it difficult for garbage trucks to set them back down. What should you do if there is a big storm overnight? Our collection routes start at different times very early in the morning. As always, set your carts out by midnight the night before your scheduled collection day. It is important to clear an area for easy access to the cans. 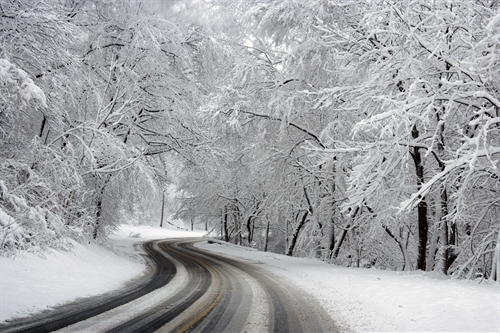 For safety reasons, our drivers only service roads that have been plowed and treated by the Municipality. Therefore, it may be necessary for some Customers to bring their trash to the main road for service in snowy/icy weather. What should you do if your trash has not been picked up? Many different variables affect our routes and drivers during a shift. There are no set times for any house to be picked up. There may be uncontrollable circumstances delaying the servicing of a route. If your trash has not been picked up by the next morning after your service day, please call us. What should you do after your garbage has been collected? Retrieve your cans as soon as possible to prevent them from blowing away or getting in the way of snow removal operations.